French Fries, Chocolate, Ice Cream, Bacon, Caramel Frappuccinos, Pizza, Cookies. All of these things are the foods most often cited by my clients that is “their thing.” You know that “thing,” the one food you don’t want to live without and the the thought of sacrificing while on a diet feels like torment. The one that if it’s in front of you is a challenge not only to resist but also hard to stop eating even if you’re full. So the question is, do you have to avoid them for life in order to get the body you want? Do you have to avoid them at all? The answer is both Yes and No. Let me explain. Obviously if these foods made up the majority of your diet, then you would be in big trouble, but there is a time and place for them. So the question is, when is that time and place? In Yoni Freedhoff’s book, The Diet Fix, he explains that people eat for three main reasons. 1 – Physical Aspect: The first and most obvious reason is the physical aspect. You have low blood sugar (you’re hungry) and your body starts to releases hormones that stimulate your appetite. If this were the only reason why we ate, then controlling our food intake would be to simple: Control your appetite and you control your weight. Obviously this isn’t the only reason why we eat and as such, it’s usually the other two reasons that cause problems for people trying to lose weight and keep it off. 2 – Psychosocial Factor: The second reason you eat is due to psychological and social reasons. For example, a social reason is if you’re out with a friend for dinner, and you’re not really “hungry” you still might decide to split a dessert with them. Beyond that, there are also psychological reasons why we eat. If you had a rough day at work and you feel mentally and physically drained, an easy way (and one way people use too often) to alleviate some of that feeling of being “drained” (at least temporarily), is to eat something sweet. The sweetness raises your insulin levels, which helps to combat your stress hormone cortisol, while potentially giving you a boost in the feel-good neurotransmitter serotonin. This is usually an awful long-term strategy for a variety of reasons, but in the short-term usually allows us some temporary relief from having a bad day. If you don’t reach for food, but instead for some beer or wine after a long day, it’s the same concept. You’re changing your brain chemistry through food or drink. It’s a strategy that’s all too prevalent in today’s society. “I feel bad throwing food out,” whether that be leftovers, not leaving food on your plate or having food in your house that you don’t really enjoy, but shouldn’t be eating (cookies you don’t really like). “It was on sale,” or free. “I deserve it…” in it’s many varieties – I worked hard in the gym, I had a rough day at work, For not buying something, etc. Although food should be enjoyed with friends and as an occasional treat after a long week, if that’s your go-to stress relief, then you might be headed for trouble. 3 – Hedonic Pleasure: The third reason we eat is simply for the hedonic pleasure of eating. If you know you shouldn’t have a piece of cake but you LOVE the way it tastes, then you’re not eating it because you physically need to or even psychological factors. You’re eating it for the pure pleasure of the way it tastes. Bacon falls into this category for me. For me, it’s not the physical or psychosocial reasons, but instead simply for the amazing taste that is bacon. The hedonic pleasure of eating is another big reason people don’t stick to a particular style of eating, “But the food is so bland,” is often cited as a reason. The truth is you can make healthy food taste good, it just takes some practice. I love eating, just for the pure pleasure of eating. Visceral pleasures make life so much better and self-proclaimed “foodies” are basically saying the same thing. The key then is to ensure that you are enjoying the pleasure of eating, while eating healthy foods more often than not. The bottom line is that we all differ in how we prioritize each of these three reasons. For me, the physical and hedonic reasons make up close to 100% of the reasons I eat. About 80-90% is the physical aspect, with the hedonic pleasure filling up a majority of the 10-20%. The Psychosocial factor doesn’t really play a part because even if I go out to eat, what I eat usually falls into what I would’ve ate anyway. As for coping with stress, I usually workout or write and it is rare that I turn to food. With that said, some people are huge psychosocial eaters. If they’re stressed, they tend to eat more carbs, or they go out to eat with a friend, where portion sizes are not well regulated and their nutrition suffers. They rarely think of the physical aspect of what they are putting into their body or more importantly why, but will eat for pleasure. In other words, there is no “right or wrong” reason to eat something, but there are styles of eating that can help you stay on track if your goal is weight loss. Of all of the reasons why people eat, this one can be the most tricky to deal with. With that said, here are three techniques if you’re trying to lose weight while enjoying time with friends. 1 – Know the purpose of the outing. Remember most of the time when you’re out with friends, it’s to enjoy their company. For example, if you’re out to celebrate a friend’s birthday (one of 20-25 throughout the year), then you don’t have to over-indulge. It’s alright if you don’t eat the cake and/or have lots of alcohol. They’ll survive and so will you. If, on the other hand, it’s your wedding, enjoy it. Food and drinks should be enjoyed with friends and family, but just because there’s a social gathering doesn’t mean that you need to overindulge in food and drinks. If, it’s a special occasion (like a once in a lifetime thing), then yes, you should enjoy yourself. If it’s your birthday or you’ve been working hard for a vacation, then enjoy yourself. It should be enjoyed, but most simple, social gatherings don’t need to be celebrated with over-indulgence. 2 – Have guidelines for your outings – For example, I eat gluten-free because I have to. Yet, whenever I go out to eat with someone, I usually get the comment, “Oh, I wish I had a gluten-intolerance because it would get rid of all of the bad things.” “Uhm, no,” is usually my response. There are plenty of “bad” things I can have while out, but I do have guidelines for my outings. As such, so should most people. Too often, without those guidelines, people will over-eat anything and everything which leads to nothing but trouble. Yours can be something like, I’m sticking to protein and vegetables when out. Or if you’re eating a cake, 3 bites. Or drinking – two drinks. Whatever your guidelines are, make them realistic for you. My guidelines are simple: Lots of protein, some vegetables and limit carbs. So if I go to a Mexican place instead of getting the nachos and tacos, I’ll get the skirt steak. 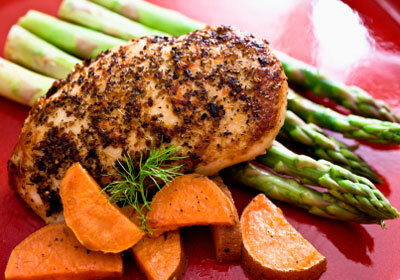 3 – Eat a protein and vegetables first. If you did nothing else, but ate a protein and vegetables first, you would be well on your way to eating relatively healthy. If after you’ve ate those things, you have room left over for other food and you want to eat it, then eat the carbs. This implies skipping the bread and fries initially. If you can do this one rule, then you’re at least getting in some nutrition even if you end up eating something “bad.” There are times when I’m starving after a long day, haven’t ate for 8 hours and I want to stop at every single convenience store to buy some chocolate peanut butter ice cream or gluten-free cookies or some Reese’s peanut butter cups (do you see a theme with what “my thing” is?). And since I pass about 6 of these stores on the way home, I need this rule. If I can make it home and eat some protein and vegetables, the cravings for the other stuff usually fall away naturally. If they don’t, then I’ll eat a healthier version of the snack (dark chocolate and almond butter). Does it take willpower? Absolutely. If I’m tired, is it harder? For sure. Does it keep me out of trouble? More than I can even say. This happens to me at least 4 times a week and 90% of the time, by the time I’m done with the protein and vegetables, I usually don’t want the snack. But if I do eat the snack, it’s one-fifth of what I would’ve ate…and that makes a big difference over the long-run. One thing people do to themselves when they eat something “bad” is berate themselves. This just isn’t necessary in my opinion. There are times when you should simply enjoy your food. If you love pizza, then having a slice or two every once in a while is fine. I love bacon and have some every once in a while. If you can’t simply enjoy food, for the pure pleasure of eating, then you’re limiting yourself to the enjoyment afforded to you by life…and that’s a mistake. Here’s a simple strategy to ensure that you’re able to maintain a long-term plan of eating mainly healthy, while still enjoying food for the pure visceral pleasure that it can bring: Have 1-3 meals per week be enjoyed guilt-free. Give yourself the leeway to enjoy the meal guilt-free. This doesn’t mean that you need to over-indulge in certain foods (I don’t need a pound of bacon, but 4 slices is good), but no food should ever be completely “off-limits” unless you’re allergic or sensitive to it. Give yourself permission to enjoy your food and in doing so, you vastly increase the odds of sustaining a healthy diet. A – There may be times when you need to be stricter with your eating. For example, if you’re preparing for a vacation or wedding that’s a few weeks away, then you might have to be a bit stricter with your eating and that’s fine. There will be times to invest in healthier eating and times when you over-indulge (think Thanksgiving and the holidays). B – Enjoying food doesn’t mean you need to over-indulge in the food. When I say have a free meal, people forget enjoying the food and instead try to stuff their face until their as full as possible. This has its place, but usually takes away from the enjoyment of the food. Just because you can enjoy something doesn’t mean you need to over-indulge. C – Know Yourself. For some people, enjoying a food that is on their “bad” list starts a ball rolling downhill that sets them up for over-indulgence for weeks on end. If this is the case, but you still want to eat for the pure pleasure of eating, enjoy the meal out with a friend. Split a dessert or buy a single item of something you enjoy. For some people, it’s not a dessert, but instead something like bread. If they have a piece today, then they have a piece tomorrow and then a couple of sandwiches the next day. For me, it’s chocolate peanut butter ice cream. If it’s around then it will be consumed, no matter the size of the container. And here’s the thing, I get the same pleasure of eating a whole quart of it as I do a scoop of it. So the smaller the size of the container, the better. Knowing yourself and the foods that trigger those types of reactions is huge. Here’s how you would bring all of this together to create a plan that’s sustainable for you. If you eat 3 meals a day and one snack per day, then in a week, you’re eating about 28 times. Between 80-90% of the time should be spent on following the principles of healthy eating. This means 24-26 of those meals and snacks should be helping you stay healthy and move you closer to your fitness goals. You go out to eat with a friend on a Wednesday. You know you shouldn’t “eat bad” as it’s a weekday, but you can’t resist the bread. You order a healthy meal, but you eat the bread. That’s your “snack” for the week. Enjoy it. After a long week at work, you don’t feel like cooking and want something delicious. You decide to have a couple of slices of pizza. Enjoy it. Saturday night you stay out late and Sunday morning you want bacon with your eggs. Enjoy it. What I didn’t include in this list is alcohol. If you’re drinking lots of alcohol, then your “free meals” should be dramatically reduced to maybe one meal per week. Overall, the majority of your meals should follow the 7 principles, whether out with friends or not with the remaining meals (or alcohol) taking up the few remaining meals that you enjoy each week. Bon Appetit!